It doesn't seem so long ago - yet it was late 2011 -when I finished reading a novel by an author whose name I had never heard - Darcie Chan. At the time I read the book, I had no preconceived notions of what the story would be about. I didn't even read the synopsis. Quite honestly, I looked at the cover and decided I wanted to read the story - so I bought it. I'm so glad I did! 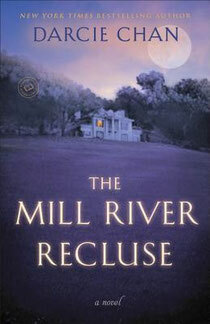 I realize this is not the first time I have written about Chan's book, The Mill River Recluse - which she affectionately refers to as The Recluse. However, there is a very good reason for that: I still cannot get the friendship between Mary Hayes McAllister and Father Michael O'Brien out of my head. It is truly the greatest friendship I've ever witnessed in a fiction book, possibly because of the longevity of that friendship. After all, how many men and women have known each other as friends for over 60 years but have never succumbed to sexual passion, despite seeing each other every day with no one else around? In fact, thanks to a disease which had no name at the time - Social Anxiety Disorder - Father Michael was Mary's sole source of information from the outside world. He introduced her to members of the town just by sharing tidbits of his day with her as she would look through her marble mansion at the town below. He tried to get her into the public on a few occasions but, each time, it was met with disaster. She was literally too afraid to be around people and felt safest when in her own home. Furthermore, I noticed that the story was germinating inside my head, as though seeds were planted as I was reading the book and now they are taking root and beginning to grow. I try to put myself into the shoes of Father Michael, wondering how he felt all those years. Of course, he had a parish to tend to but, even so, it had to be a struggle knowing that one of the women he loved most in the world - on a platonic level - could never be part of it, in person. He could share the stories but, even so, it was different than if she had been able to attend events in person. Then I place myself in Mary's shoes and wonder how she felt. Of course, with her anxiety, she felt more secure and at peace than I would being placed in those same circumstances but, even so, it had to be a struggle to always be on the outside, looking in. Truly, I can only imagine what it must have been like. All in all, Darcie Chan has a real winner with The Mill River Recluse and it's a book I would strongly recommend to anyone. The depth and detail of the story truly took me by surprise. If you would like to learn mroe about the book, please click the book cover; you will be taken to The Recluse's page on Amazon.